General notes (Photo by Ed Marshall, click below for more photos) The original Senjuin school was located in Yamato Province. Yamato-den is the oldest of the Five Gokaden, and said to be the birthplace of the Japanese Sword. The Senjuin school is also noted for being the oldest of the five main Yamato-den. The Mino-den or tradition is the youngest of the Gokaden with a short history compared to the other four traditions. While there exists documentation of it's beginning in the Hogan era (1156-1159), the oldest extant works are by Kaneuji and Kinju the late Kamakura period (1186-1333). The Mino-den reached it's zenith of production in the late Muomachi Period (1392-1573). This was directly related to the Sengoku or warring period. 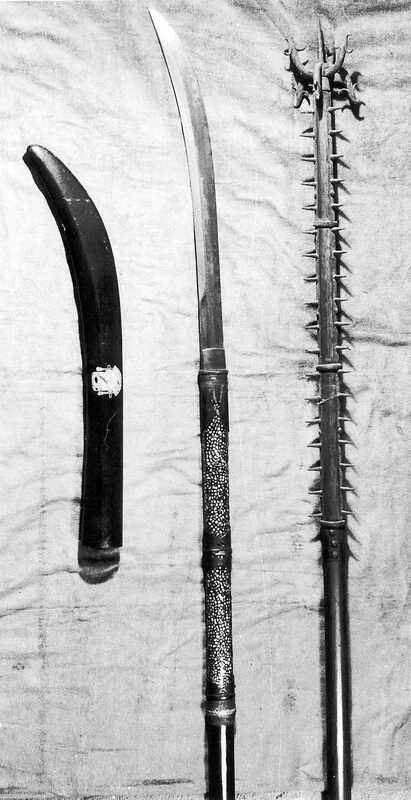 Many blades were needed for the Battlefield and the numbers produced by the schools of the Mino-den were only exceeded by the schools of the Bizen-den. 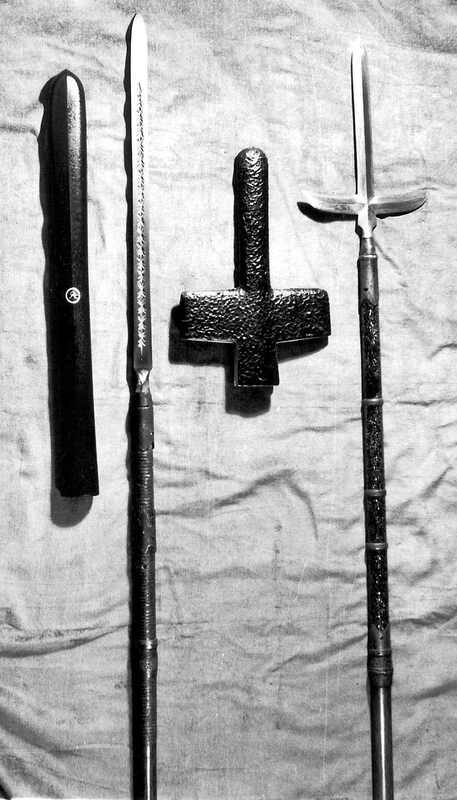 Mino swords as a whole were not necessarily prized for their artist merit, but were sought after and highly prized as durable, reliant, and extremely sharp swords. The two most famous Mino smith's were Magoroku Kanemoto and Izumi no Kami Kanesada. Through these two smith's the Mino-den achieved perfection and became the dominant school of sword forging. They remained in a dominant position through the Momoyama period (1596-1644). The Mino Senjuin school, later known as the Akasaka Senjuin school was founded by Kuninaga Senjuin, c. 1381. There were two successive Kuninaga generations which followed, as well as a number of other smith's. A great number of swords were forged by this school, with swords by Mino Jumyo being the most numerous. The Mino Seki schools still exist today. Ken or Tsurugi is a double edged blade which were used as Buddhist esoteric implement's opposed to weapons. They were generally given as a gift to a temple or for the spiritual protection of the home. This is a very large Ken attributed to Mino Senjuin School. This Ken may not have been made as a weapon, but the sheer size and weight of it would indicate that it is quite capable of more than only spiritual protection. This Ken exhibits typical Yamato traits such as Ko-Mokume hada and Chu-suguba hamon. It is in very good polish, with a few light surface scratches under the habaki. These scratches can not be seen when the habaki is in place and pose no detrimental effects to the aesthetic value of this beautiful piece. This Ken was once accompanied by papers from the NBTHK which attributed it to the Mino Senjuin School, sadly they have been lost. 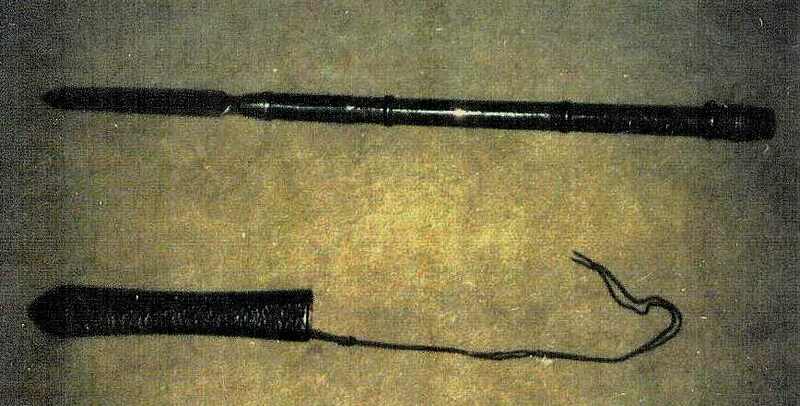 Saya notes The koshirae is complete with the exclusion of a kozuka. The saya is in great condition for it's age with only minor erosion around the horn fittings. The string wrap on the handle is just gorgeous and really makes the koshirae nice. General notes (Photo by Ed Marshall, click below for more photos) Rare Kikuchi Yari signed Bishu Ju Fujiwara Ason (remainder cut off). The blade is in overall good condition with some wear, surface oxidation, and surface scratches. Iyo no Ju Munetsugu (Hizen) Sampaku Yari. Genuine, per Dr. Sato & Dr. Homma. Only yari by this man either has ever seen. Polished.